Offering Red Deer's best special offers and deals! Spend your summer with us! The hotel is only a 10-minute drive to Red Deer’s unique arts, culture and heritage scene, as well as eclectic entertainment and dining choices. Stay with us and enjoy free WiFi, 24-hour fitness centre, a 45-000-gallon indoor pool and whirlpool, and an outdoor courtyard perfect for pool parties and BBQs. Our in-house shops, restaurants and attractions make us the ideal venue for a summer getaway. Call 1-800-662-7197 and ask for our Stay 2 Nights, Save 20% rate. Stay 2 Nights, Save 20%! *Offer must be booked by September 8, 2019 for stays between June 24 to September 8, 2019. Subject to availability. Rate quoted is per room per night, based on double occupancy. Taxes are extra. Offer cannot be combined with any other promotion or discount. Minimum 2-night stay, blackout dates may apply. Not applicable to group bookings. Get more from your AAA/CAA membership at Cambridge Red Deer Hotel. Members enjoy discounts starting from 10% daily. Call 1-800-662-7197 and ask for our AAA/CAA rate. *Subject to availability. Black out dates apply. 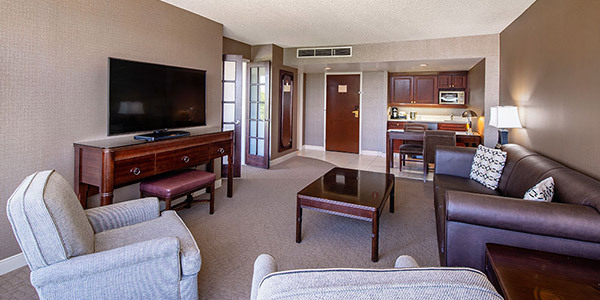 Choose from one of our luxurious and unique suites and get 25% off regular rates*. Includes access to our Cambridge Club Lounge featuring breakfast, all day snacks, evening appetizers and beverages in a relaxing atmosphere. Enjoy free WiFi, the use of our facilities and menus that suit your style in one of our restaurants and lounges. Call 1-800-662-7197 and ask for our 25% Off Suite Deal. *Offer is subject to availability. Rate quoted is per room per night, based on double occupancy. Taxes are extra. Offer cannot be combined with any other promotion or discount. Some restrictions and blackout dates apply. Not applicable to group bookings. Escape to Red Deer and enjoy exclusive rates only offered to residents of Alberta and British Columbia. Call 1-800-662-7197 and ask for our resident rate.